Massimo Corona (second from far left, standing with baby) at the Second Kopan Course, 1972. 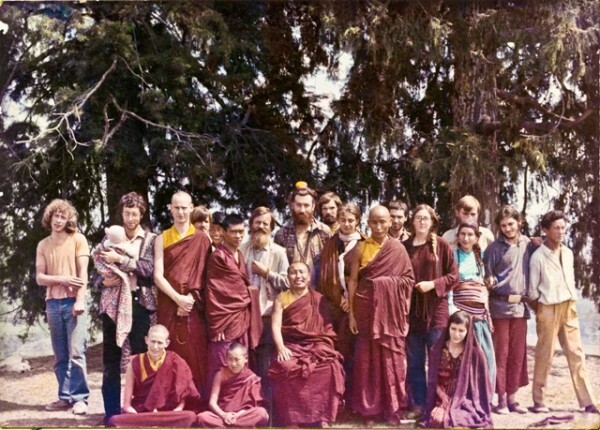 Photo courtesy of Lama Yeshe Wisdom Archive. 1968 was a special year: students were in revolt, the psychedelic universe was coming into being, and I was looking for the real meaning of life. I was born into a rich family, had gone to school in Switzerland, and a position in my father’s company was assured. But something was missing. The thought of being a rich entrepreneur like my father was not attractive at all. That year, I was attending – or pretending to attend – the second year of the Bocconi Business School in Milan, Italy, but I was also smoking a lot of pot and doing some LSD. Slowly, something changed in my vision of life and I started looking for some answers. After reading a few books on Eastern religions, I decided that I had to find a master who could give me those answers. I had a couple of friends who had already left for India and Nepal and from their letters it seemed that they found their answers. So, I decided to drop out and go to India. As I did not want to ask my father for the money for my trip, I worked for a year or so and eventually bought a one-way student charter flight from Milan to Delhi for 90,000 lira (equivalent to US$55 today). On June 21, 1970, I left with my girlfriend Carol [Chaney] and my friend Claudio [Cipullo]. We spent the first six months traveling all around the country – Kashmir, Manali, Goa. I became bored and took a boat with Carol to Malaysia. I stayed there for about six weeks with her and my little 16-year-old brother Luca, who was also traveling with us. Carol wanted to continue to Bali, but I was undecided. One night, I had some sort of intuition: if I continued to go East, I would just end up back in the West where I began my search. So, traveling was not the answer. I was reading a book by a swami with an ashram in Rishikesh, Uttarakhand, in Northern India and felt that that was the place I had to go to find answers. Carol left for Bali and I went to Bangkok with Luca. We wanted to go to Cambodia and Laos, but the visa was refused, I think because of the Vietnam War. Again we split. Luca went to Kathmandu and I traveled to Rangoon, Burma, where I stayed only a couple of weeks. I did not originally want to go to Kathmandu because I was heading towards Rishikesh, but when I arrived in Calcutta, I received a letter from my brother saying that he was in Kathmandu and that he had lost all of his money. When I arrived in Kathmandu, Luca told me that Claudio was living in this small monastery called Kopan outside Boudhanath and that we should go see him. I had intended to stay in Nepal only for few days before going to Rishikesh to find that ashram, but I agreed because Luca insisted. In Kopan at that time there was only one building: the old villa, the former residence of the king’s astrologer. Claudio had a room in Ram’s house, a farmer’s mud house nearby where I later lived for almost a year. He brought me to visit the monastery and in the hallway to the gompa there was a poster with a diagram depicting the four noble truths and a brief explanation of them. What a shock! This teaching was exactly what I needed: suffering (I knew that, I was living with it), the cause of suffering (exactly, this is what I needed to find out), cessation of suffering (what a relief!) and the path leading to such cessation (let me begin right now!). Lama Yeshe with his dog Dolma, 1971. Photo by Fred von Allmen. The day after, Claudio brought me to see Lama Yeshe. He was living in a small and very dark room, with only a mattress on the floor and a little table. We sat on a carpet that was on the floor. Claudio introduced me as Piero [Cerri]’s friend (Piero was the first Italian disciple of our lamas). Lama laughed for a long time when he heard Piero’s name. “I want to take teachings from you and learn about the Dharma,” I said. Lama was teaching twice a week: on Monday for the beginners (where I belonged) and on Thursday for the more advanced people who had already attended the first Kopan Course, taught by Lama Zopa Rinpoche. This was September 1971. 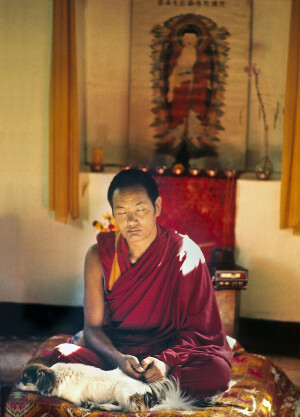 Lama Yeshe’s teachings were just amazing. I felt he was always talking about my mind, my situation, and what I needed to do to cope. He would meditate with his students for an hour, maybe one day a week, maybe more often. He didn’t exactly lead the meditation sessions as we do now. Instead, he would sit facing the students in complete silence for the entire hour. Not even a word, just the sound of the singing bowl at the beginning and at the end. It was magical. My legs would hurt like crazy only after 20 minutes, and then my whole body would start to burn like hell. But my mind was another story! At the Lawudo Lama’s cave, Nepal, 1972. 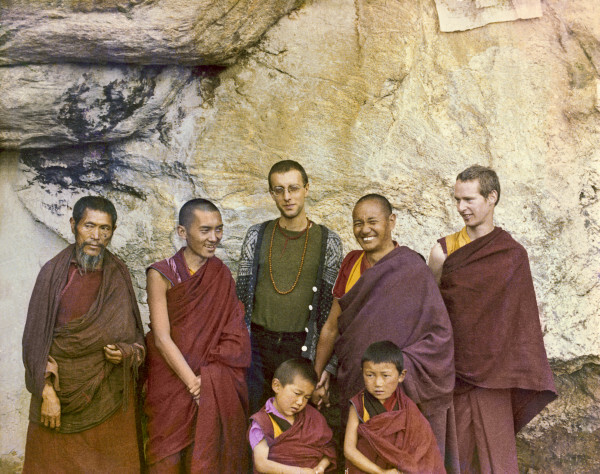 From the left to right: unknown monk, Lama Zopa, Massimo Corona, Lama Yeshe, Jhampa Zangpo, with two new Mount Everest Centre novice monks. Photo courtesy of Lama Yeshe Wisdom Archive. I stayed in Kopan until December 1972, only leaving once for three months to go to Lawudo, up in the Himalayas. This happened 40 years ago. Now I can say, in full honesty, that I’m very happy that throughout this time I continued to work and live in the mandala of our two lamas. I went through many ups and down (who hasn’t? ), but I’ve always been here. And, after all this, I can say that some Dharma has penetrated deeply into my heart. Massimo Corona has devotedly served in FPMT since 1971 in various capacities, including as an early founder and director of the successful Istituto Lama Tzong Khapa in Italy, as director of FPMT International Office from 2000-2006, and as director of FPMT Mongolia. He currently lives and works at Istituto Lama Tzong Khapa as a consultant for different projects.